Alrighty Guys, it is time. We are heading over to Walt Disney World’s Downtown Disney to travel back 200 million years for dinner. We’ve gotta do T-Rex again. This super-themed-to-the-max restaurant is the sister of Rainforest Cafe. If you’ve been to one, you have an idea for the feel of the other (even if the themeing is different). I’ll confess I wasn’t looking forward to this Advance Dining Reservation with great anticipation. But every restaurant at Disney deserves a little love from me, right? 😉 After all, it’s my job. So on a recent visit, over I went to check out if my experience would be better, worse, or the same as my previous visit. Besides, there’s a Cotton-tini involved this time! More on that just around the corner. Let’s go! 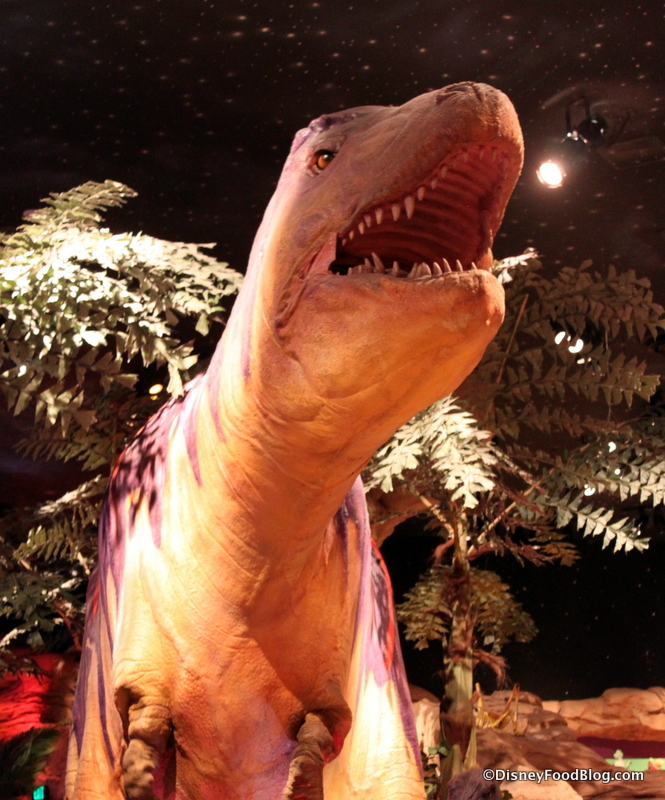 As you probably expect, there’s a whole lot going on when you walk inside T-Rex. The outside view of rock outcroppings and dinosaurs give you an idea of what you’re in for. 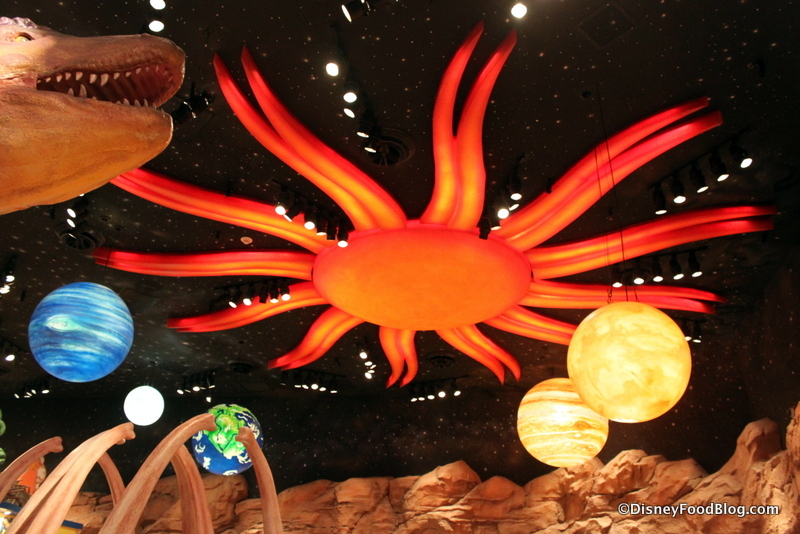 Once your eyes adjust, you’ll notice that there are four major themed areas inside the space. 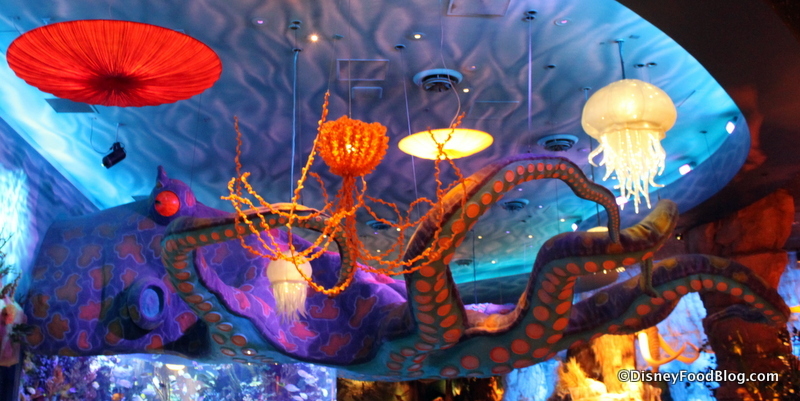 The bar is themed to look like an Undersea Scene, complete with a giant, moving octopus. (What?! It’s true!) You’ll see some jellyfish floating above you too. 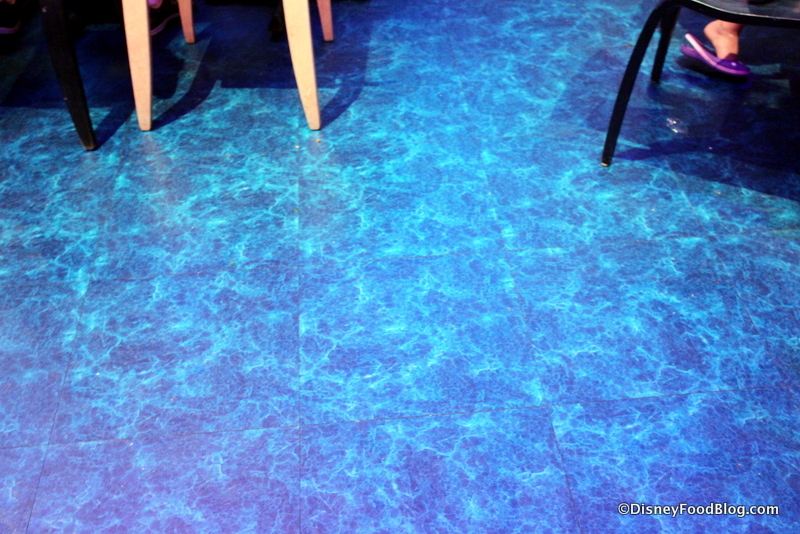 The floors throughout the restaurant are themed as well. Check out the watery undercarriage of the Undersea Scene. These are actually tiles printed like water. 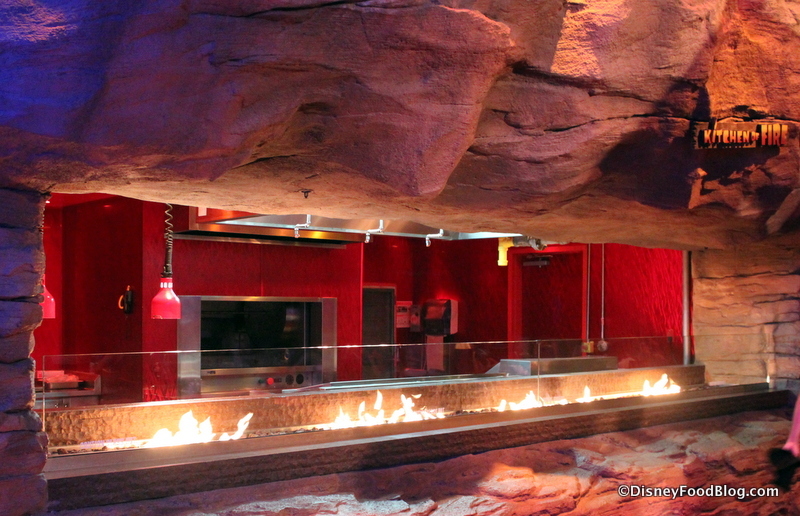 The themeing throughout the restaurant does vary a bit. A lot actually. Beyond the sea, you have a verdant Forest Area, where you can sit in the belly of a Triceratops if you’d like. (I have asked how I can get this table. I want to sit in that Triceratops. 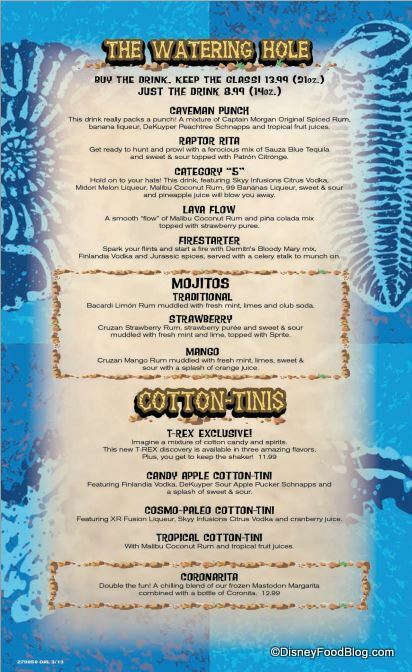 If any of you are willing to join me on a Triceratops challenge, let me know and we’ll go and wait for this table some night! And then, there’s the Meteor Shower Room. Somehow you are simultaneously on Earth and viewing Earth. (Don’t think about it too hard.) 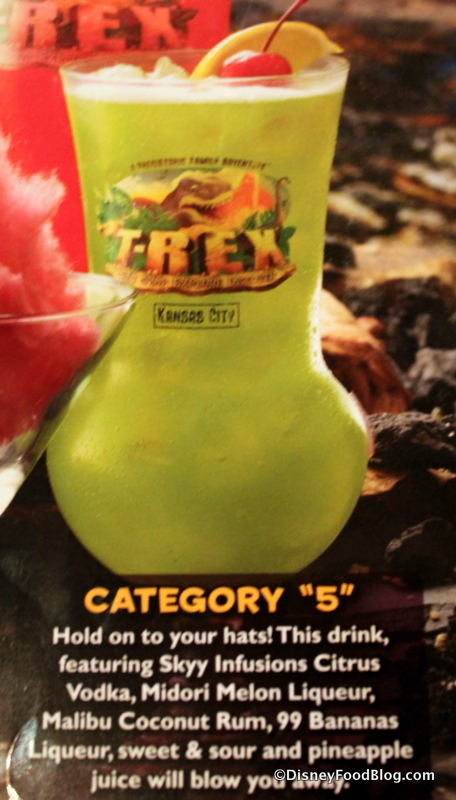 You’ll find the star of the show here — T-Rex himself. Be forewarned — this room is very, very loud at regular intervals. Like every 10 minutes, when meteor showers rain down from the heavens. Did I mention that it’s loud?? 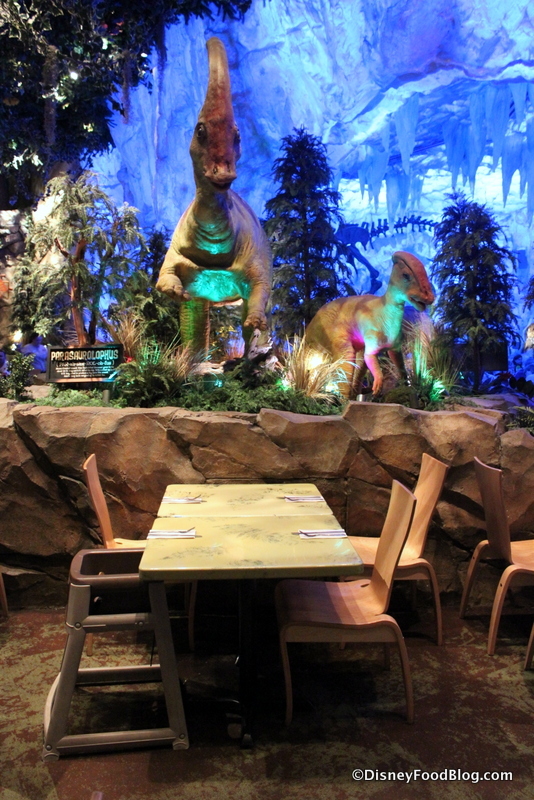 Seating near the animatronic dinosaurs brings your experience to life. And for educational value, they have plaques scattered throughout the scenes that tell a little about the creatures. The fire is actually a pretty cool touch. If you think so too, you might enjoy sitting nearby. This Wooly Mammoth and her Wooly Babies are hanging out near the ice cave. And speaking of the Ice Cave…it really is spectacular. It makes you feel like you should go and grab a jacket! 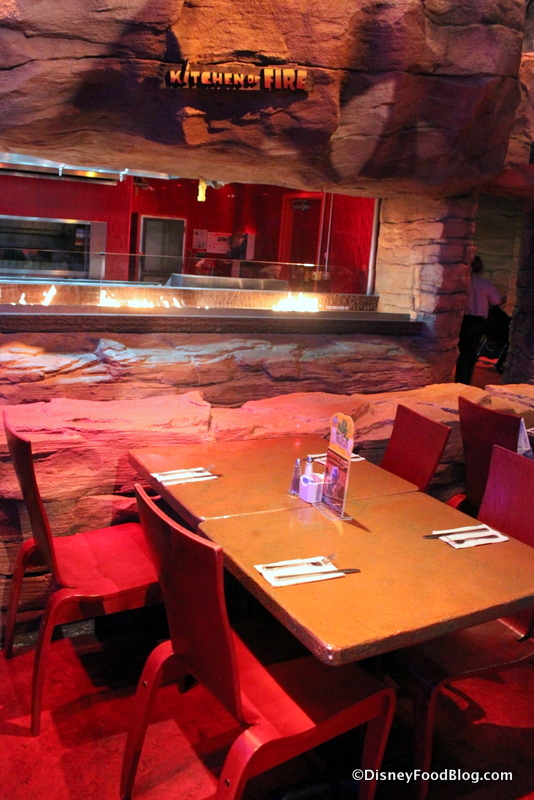 Lights change throughout the area as you dine, creating a dazzling effect. 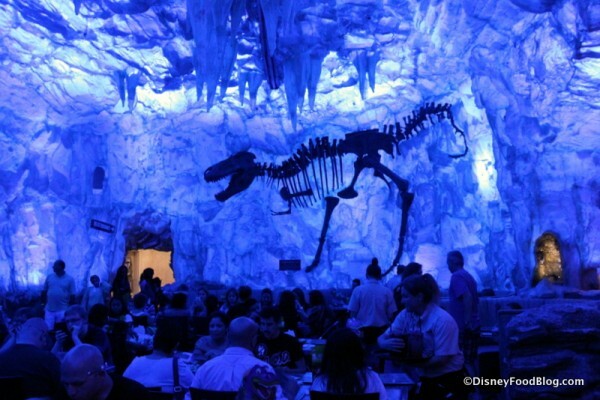 You’re surrounded by ice, and there’s a T-Rex skeleton encased in the frozen wall just ahead of you. That said, I DO always request NOT to be seated in the Ice Cave. The lighting is such that your food always looks either purple or blue…and never the color it’s actually supposed to be. 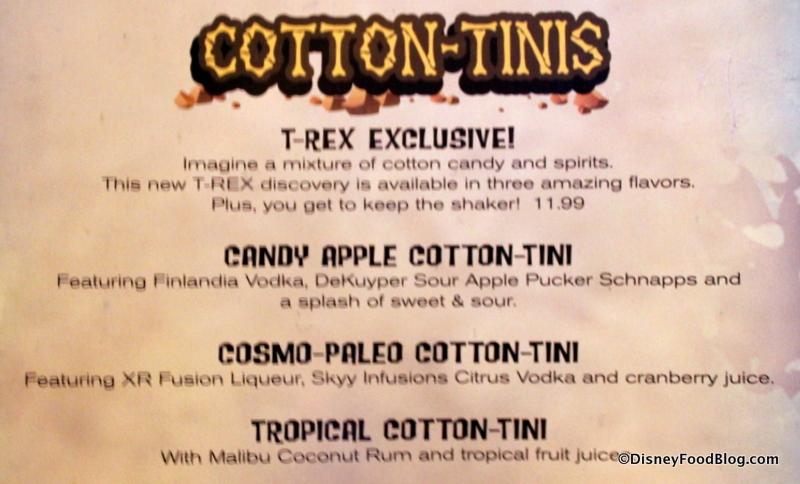 That’s pretty unappetizing to me, and when I’m paying T-Rex prices, I want every possible shot at enjoying what I order. So, we were initially seated in the Undersea area, which I thought was awesome. But when I got to the table, it was RIGHT next to the kitchen. We requested to be seated elsewhere, and were brought over to the Forest area…right NEXT to the Triceratops. Sigh. Maybe next time. So, we mentioned this before, but it certainly bears repeating. The menu here, especially by Disney standards, is massive. Like, 6 pages long. So expect to pour over it for a while. But the first two full pages are made up of Beverages. Once you get your drink order sorted out, you’re a third of the way home. And there are some interesting options. We noticed they’re very proud of the Category 5. Maybe ’cause it’s hurricane season? Another member of our party knew right away what she was having (well, she may have had a little urging from me) — the house exclusive Cotton-Tini! This drink has been a legend for a while now. 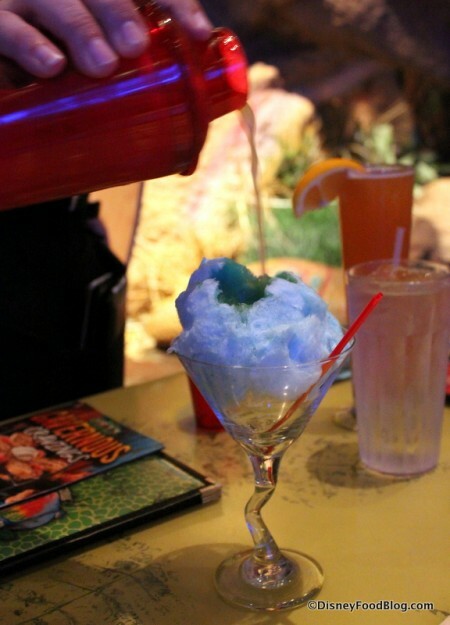 I’ve even wondered if it inspired similar drinks, like the Cotton Candy Lemonade at Everything Pop Food Court, and the new (to us anyway) Carnival Cocktail at Chester & Hester’s Dino-rama. Now, there’s a whole little show that goes along with this drink. 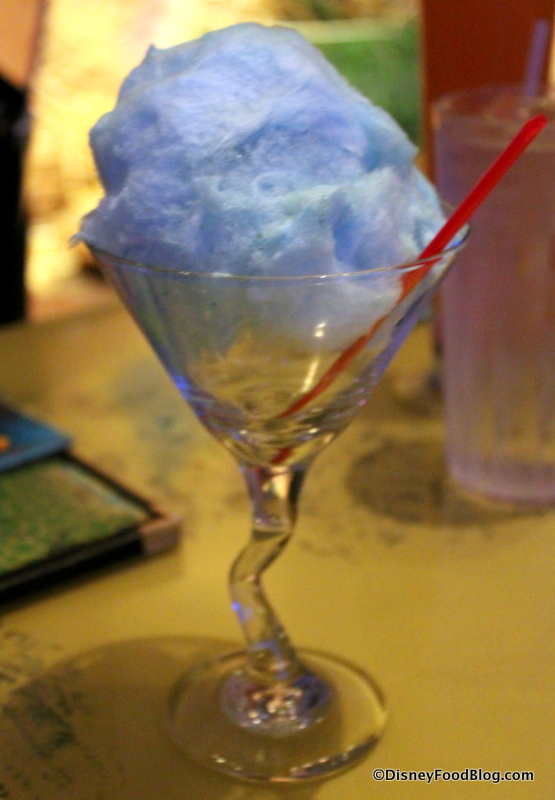 First, your server will place a martini glass with a tuft of Cotton Candy in front of you. Next, he or she will go to town, shaking up the liquid portion of your cocktail in a vibrantly-colored Shaker. The cool part? You’ll take the shaker home with you at the end of the night! Once the drink is properly chilled, it’s strained through the lid onto the waiting cotton candy cloud. And that’s where the magic starts to happen. 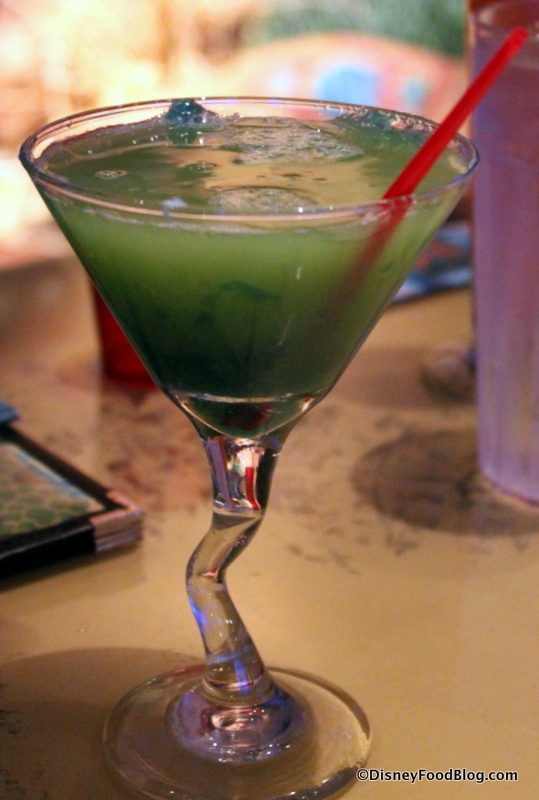 Blue cotton candy + a yellow cocktail mix = a lovely, bright green cocktail! Ah! Green! See — I told ya. And it pretty much tastes like sour apple candy in liquid form. 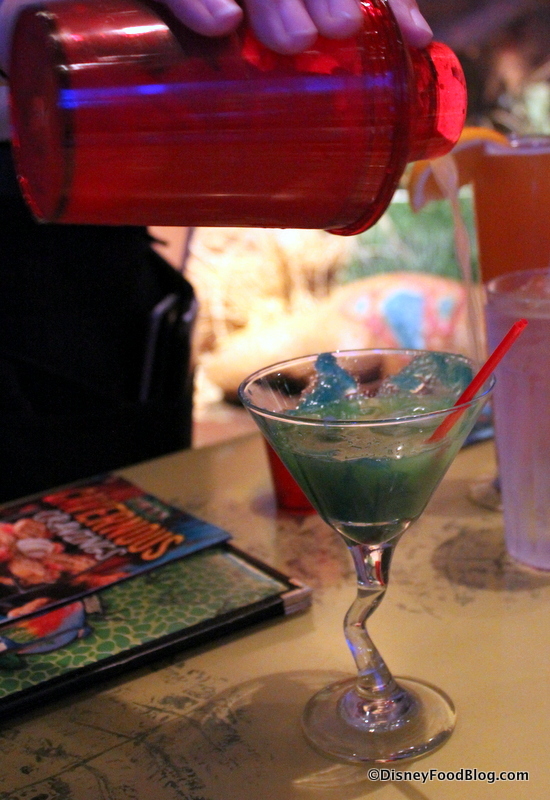 This is one fun drink. There are lots of other drinks to choose from, including a small selection of Beer and Wine. You’ll also find some specialty Non-Alcoholic Drinks. Another dining companion went for a Blue Moon, one of the beers T-Rex featured on tap. 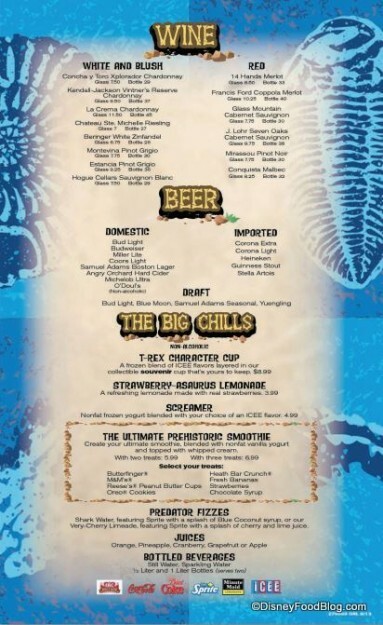 With drinks to sip on, we turned our attention to the rest of the menu. Basically, there’s a page or so for nearly every category. 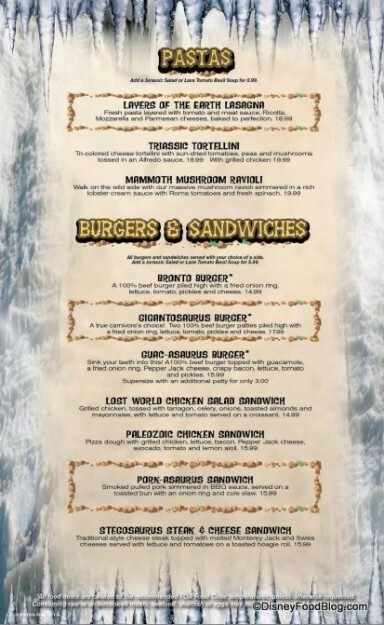 As you’re reading through the menu, be sure to notice the background of each page. They represent the different zones within the restaurant itself. Be prepared to have a sense of humor where the food names are concerned. You’re about to encounter lots of MEGA- this and PALEO- that. They don’t pass up a single opportunity for prehistoric-inspired alliteration. It makes ordering a pretty funny affair. I’ve also included the back of the menu, which tells a little about the restaurant’s theme. 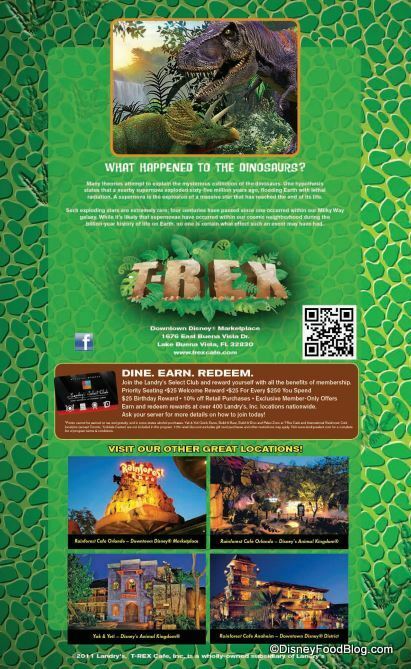 It’s also worth mentioning that T-Rex is a Landry’s restaurant. If you enjoy this family of eateries, you may want to look into a Landry’s Select Club membership. It could save you money. We made our selections, and soon the food began to arrive. 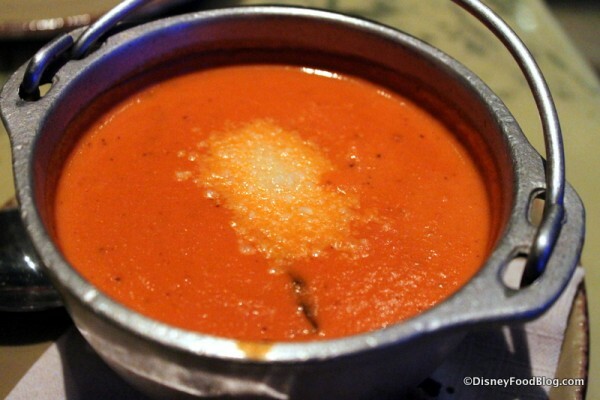 I enjoy starting a meal with soup and so I gave the Lava Tomato Basil a try. 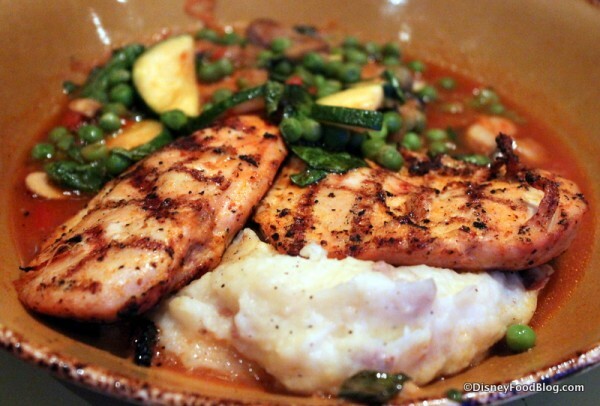 It was highly recommended by our server, and the generous portion was creamy with good tomato flavor. It’s also served in a little pot with garlic bread. Fun! 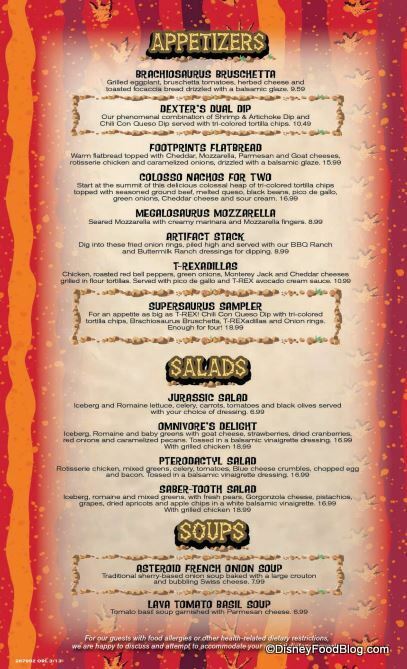 We also ordered the Megalosaurus Mozzarella to share. 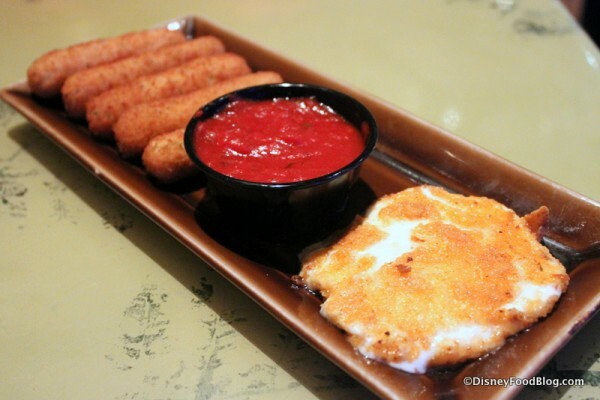 The platter offers two takes on Fried Cheese — traditional Mozzarella Cheese Sticks as well as something called Seared Mozzarella. While we ate the sticks with our fingers, we dipped forkfuls of the latter into the Marinara Sauce that accompanied them. This stuff was pretty standard, though the seared mozzerella definitely had the better flavor of the two versions. One of my friends ordered the Bronto Burger. This was a pretty substantial burger with all of the trimmings, including a thick-cut, breaded Onion Ring. 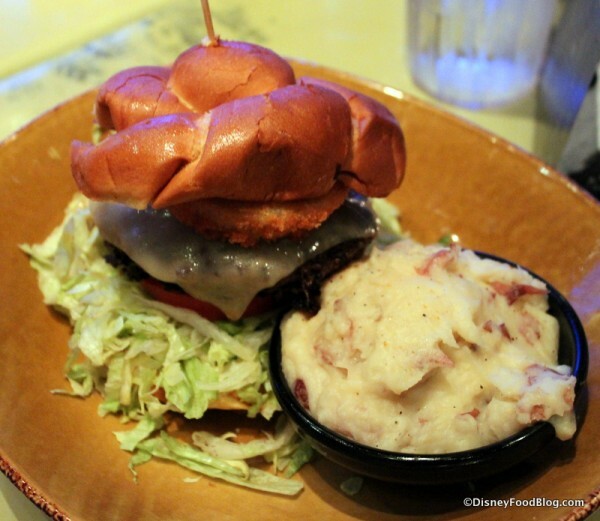 Burgers and sandwiches now come with your choice of side, and he went for the Red-Skinned Garlic Mashed Potatoes. 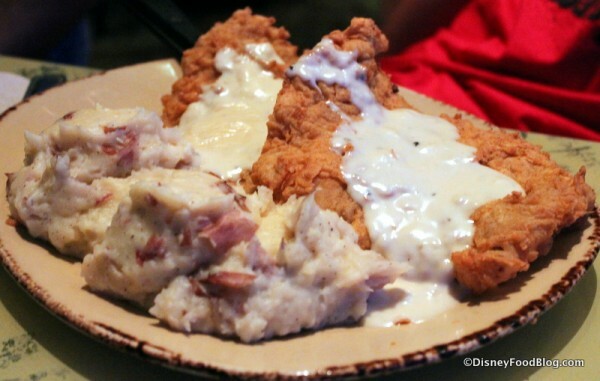 Another dining companion opted for the comfort food option, Cretaceous Chicken Fried Steak. The portion was enormous! Seriously, it’s huge. The dish could easily be split by two hungry people. Our other friend opted for a lighter dish and went with the Wooly Mammoth Chicken. (No, I have no idea what’s wooly about it.) Served with a bountiful side of Sauteed Vegetables and Peas, this was the most green we saw on our table. (Well. Besides my drink. 😉 ) She appreciated the lighter Grilled Chicken and flavorful Tomato Sauce. There was also Sauteed Spinach in there! And the Red-Skinned Garlic Mashed Potatoes provided a rich component to the dish. To that, I was invited to add another side, so I chose the Cinnamon Apples. The plate was picture perfect. My sides were delicious, but I didn’t eat too much of my steak. It looks great, but it didn’t taste as fantastic as I wanted it to. It was pretty gristly, so getting to the actual flavor took some doing. Unfortunate; I was really looking forward to it when it landed in front of me. After big plates of food and plenty of other things to eat and drink, we could have skipped dessert. But we didn’t! We all decided that Chocolate sounded best, and so it was a logical choice to try out the Chocolate Extinction. This is a platter of dessert, with four big servings of Chocolate Layer Cake, four scoops of Vanilla Ice Cream, and Whipped Topping. It says it can feed four, but I figure twice as many people could have gotten a fork in there, especially after a big meal. The dessert was pretty good, but it could have used a LOT more Sauce. But isn’t that always the case? The Heath Bar Toffee Crumbles on top were a nice touch, though. 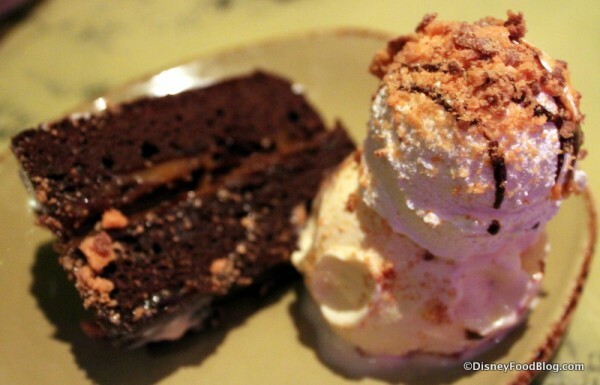 And on that (chocolate) high note, we wrapped up our meal and headed out for more Downtown Disney fun. What can you say about T-Rex? I have been thinking about it. And the profound statement that I have to offer is — it is what it is. This is not a gourmet meal. But it’s not supposed to be. The atmosphere continues to be the draw, and the food is adequately rises to the occasion. Sadly, the prices are significant; so if you don’t have a person in your party who’s going to be wowed by the atmosphere or can’t wait for that Chocolate Extinction, you may find it to be too hard on the wallet for what it offers. It’s not the worst restaurant that I’ve been to, but it doesn’t hold any particular charm for me. Still, I know for all of its detractors, T-Rex has some die-hard fans. 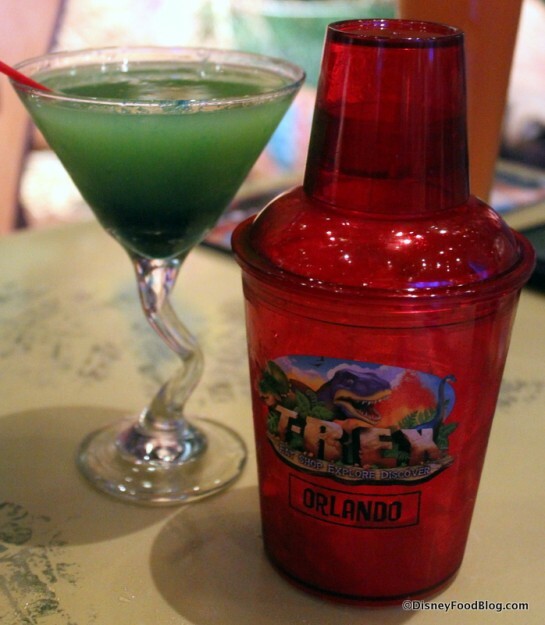 So let’s hear from you: Is T-Rex a must-do, or a must-skip? Join in the conversation by leaving a comment below! I agree with you. It is a one time thing to take your kids to but after that…. too expensive for a chili’s, TGI Fridays type restaurant. If you skipped a cocktail, app and desert maybe but who wants to. Cool experience but they need to downsize the pricing. oi. 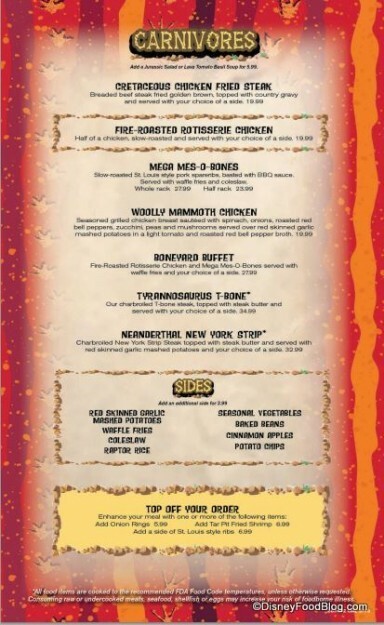 vegetarian options are extremely sparse… they do know that 65% of dinosaurs were herbivores, right? We ate here in 2012. I have a gluten allergy and was able to easily find something I was interested in having, but my son, who is wheat and dairy free, had very few choices. He ended up having gluten free pasta with olive oil on it and sorbet for desert. 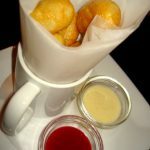 While dining with allergies always takes a little longer, the chef has to take our order and prepare our food, our service was memorably slow at TREX. We waited almost 40 minutes for deserts, and the entire service took well over 2 1/2 hours. Even though we were seated immediately we spent way too much of our precious Disney vacation time sitting in this restaurant for a less than impressive meal. My kids, then 3 and 5, were entertained by the restaurant initially (which is exactly why I booked it) but after an hour they had had enough. We ate here for the first time in June. I had the quesadilla, sister had hamburger, son had the steak but I don’t remember what picky granddaughter had but she ate all of it. For dessert we had the meteor bites for 4. 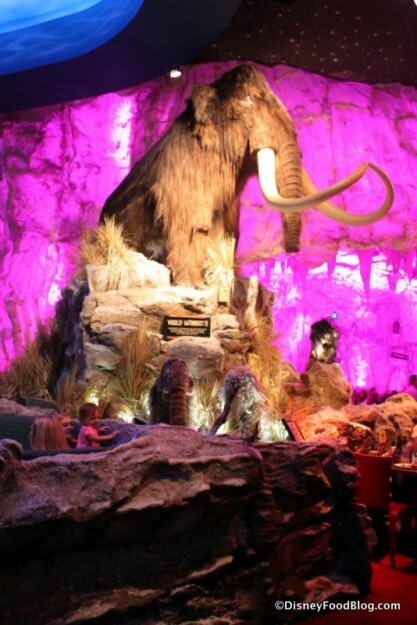 We loved the food, atmosphere, the gift shop (dino-bear) and we will eat here again. We ate there a month after it opened with some friends. The atmosphere is very exciting–if you don’t have a kid with special needs who is so frightened by the dinosaurs roaring that his dad had to take him to the restroom to decompress. We were seated near the very cool octopus bar, although we did not choose any alcoholic beverages. The staff was working very hard, but as others have noted, the service was slow. The servers were very pleasant despite the chaos. The food, when it arrived, was mediocre at best. My son had chicken strips with waffle fries (the fries were the best prepared part of our meal), I had the tomato soup and a chicken salad sandwich on croissant (normally eat vegetarian but the selections didn’t move me), and my husband ordered some kind of sandwich with meats and cheeses. The soup was very tasty but only lukewarm; the sandwich well-filled but so cold you couldn’t taste it. My husband’s sandwich contained such poor quality meat that he gave up halfway through. Our friend ordered the Chocolate Extinction for the table to share, and it was more than adequate for six of us. This is a fun treat but not something I would go back to this restaurant for. Expensive, disappointing food, noisy; the great theming did not make up for its shortcomings. Too many other good choices at WDW. I pretty much agree with your review, though I’m likely to rate it much more harshly. 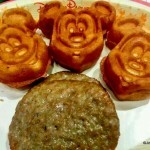 I was a relative Disney “newbie” when I ate here with some friends about 4 years ago. When I heard about the reservation, I was so excited. The 40 minute wait for a table–despite having an ADR–began to sour my view of the restaurant. Being seated in the meteor shower room took my rating down a few more notches since the noise rendered conversation practically impossible. I sort of expect inflated prices at Disney, but the food itself fell completely flat for me and couldn’t justify what they charge. I don’t even remember what I ordered, but I do remember I didn’t enjoy it. Since then, I’ve had many wonderful meals elsewhere on property. While I may pay a few extra bucks more than I would at “comparable” restaurants at home, the theming and service typically make up for it and otherwise don’t leave me feeling like I’ve wasted my money or time. T-Rex, though, just didn’t do it for me. I don’t see myself ever going back. LOVED TRex…we had the tbone steaks, and they were delicious. Waayyyy too much, but so very good. 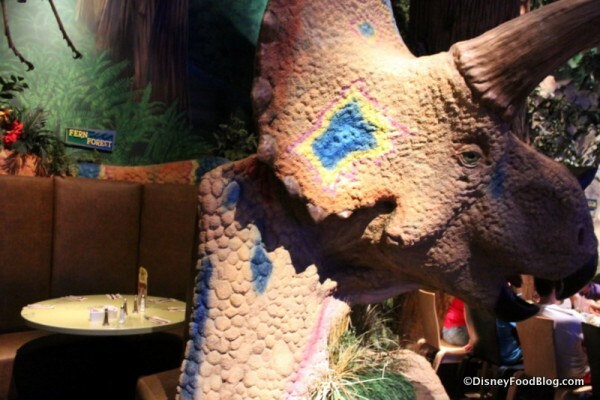 The atmosphere was so much fun..we sat right next to a triceratops with her babies (affectionately dubbed ‘Fredericka)..who kept trying to steal our food! Next trip we plan on going back a few times..one of our favs! I’m sure my 6 yo grandson would enjoy it, but I opt for lighter and healthier fare!!! 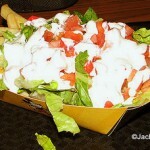 Portions too big and too calorie laden for my tastes!!! But a fun review! I actually love T Rex. That being said, the only thing I ever go there for is one of their awesome burgers for lunch. I don’t think I would consider anything else, but their burgers are huge and pretty delicious. I also don’t order drinks or dessert so the price is not bad for me. We ate there in 2012 and oh my it was so loud and I am talking sensory overload loud. I also remember the food being ok. Not good not bad, just ok. However, we did go to their sister store in Kansas City a few weeks ago. We went there soon after it opened on a weekday and it was almost empty and dare I say enjoyable. 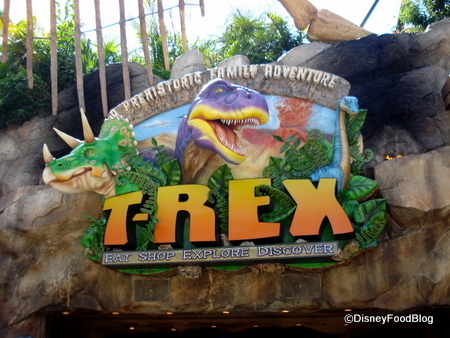 We did not eat there, but the staff was kind enough to let us wander around and see all the dinosaurs. The kids actually loved it and it wasn’t overwhelming either. The food wasn’t too bad. We were more disappointed with the accessibility issues. They set me (in a scooter) way in the back of the restaurant when there were few diners. When it was time to leave, the place was packed, no room between tables that we could get to the restroom and then leave. Poor planning on the hostesses’ part. Also, no room in the handicap stall for my scooter. Got stuck and had to have several other women try to get me out. Will NOT be returning. Like Laura, I also have a gluten allergy and had to speak with the chef before ordering. Our server forgot to even follow up on it which caused significant delays in service and even ordering, and then brought a side salad out to me with a big chunk of bread right in the middle of it which caused even further delay. On top of all this, the server kept pushing the “club” claiming there were several Landry’s restaurants in our area (there are none within 80 miles of us), at one point admitted to us that he had given our drinks to another table that he had forgotten about, and then decided it was okay to ask me about my allergy related symptoms. When we called the manager over to complain about the wait, the service, and the lack of care, she didn’t seem very interested either. We were completely unimpressed with all of it. Even the atmosphere, which my daughter loved, didn’t make the experience better. Even the food was nothing great. 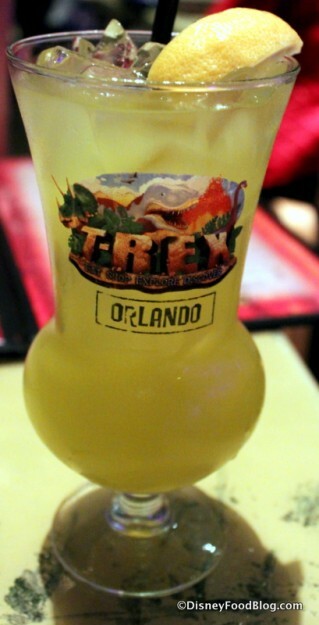 Almost three hours we will not get back and I still had a reaction later, the T Rex food being the only source. Very disappointed and very glad this is not a Disney restaurant, even if it is in Downtown Disney. I went once in May of this year. Food was average at best, but it’s not much worse than Paradiso. The service was friendly, but a bit slow. I might go back under the right circumstances. I was wondering if you can go without a reservation and just sit at the bar. I wouldn’t necessarily order food, maybe just an appetizer. Has anyone done this? Those cotton-tinis sound great for a late night drink. T-Rex is a “we took the 14-year-old, he loved it, we survived it” kind of restaurant. My bank balance will recover eventually. It’s expensive for what it is, since the food is OK but not great. Portions of what we ordered were large-ish, which doesn’t always mean it’s good value. I would have preferred a better quality meal and smaller portion, to be honest. The theming here is what you go for, not the food. If you have someone – probably a young someone – who loves dinosaurs then this is a good place to go for the “wow factor” special evening out. Also, try getting out of here without spending even more money in the Build-A-Dino store. I would go to the Rainforest Café rather than the TRex. If everyone else picked TRex, I’d go for them, but I prefer the wildlife at Rain Forest, myself (food is pretty much the same at each). We have been here three times. With the preteens and picky eaters it was a big hit. With the tired grown-ups not so much. 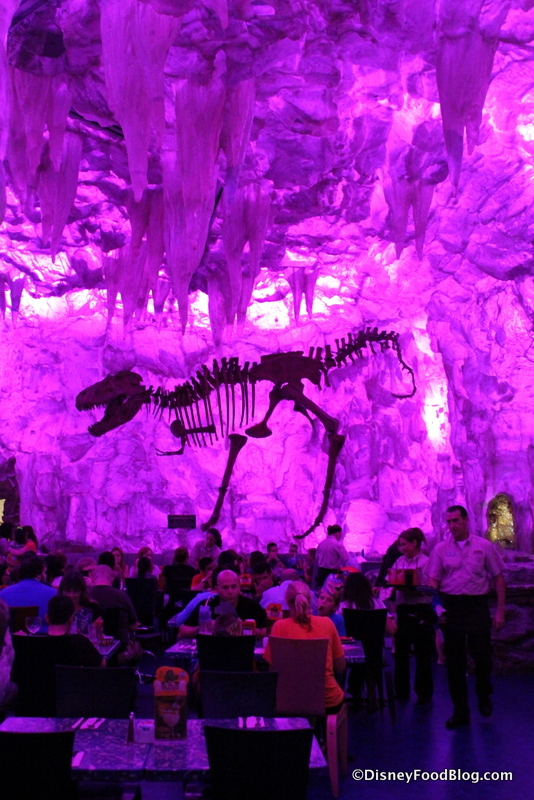 (Especially cranky mother-in-law) Not a place to have conversations, very loud, but the emersion atmosphere was awesome especially for the younger ones and the dino-dig area was a great distraction while grown-ups finished eating. It is the same food at Rainforest, which I think of as fine. 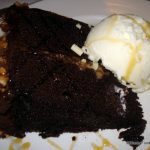 I recently reviewed this restaurant thoroughly, and here is a summary of the main points. As other posters have said, it’s the atmosphere here that draws you in, and it’s set up mostly for kids. I think most children would love the overall experience, but if it’s just adults, it’s really not meant for our enjoyment. Also stated by others here, the pricing is somewhat high but unlike other Disney restaurants, the food quality doesn’t hold up to the price. The food is mediocre at best, but the portion sizes are quite large. Just not large enough to justify the price. 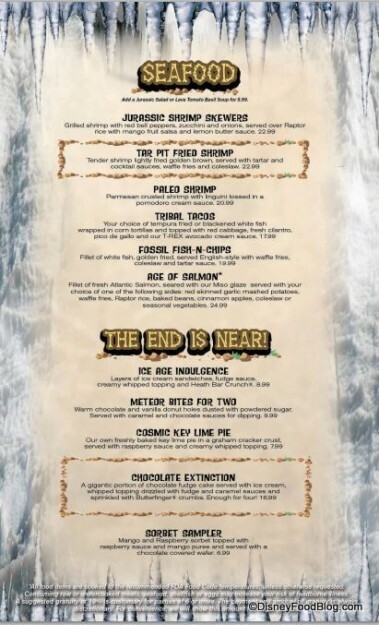 I personally looked most forward to ordering the Chocolate Extinction for myself (I don’t share desserts), and I did think that was the highlight of the meal. I felt the dessert was pretty good, and actually justified its own price. It is definitely large, and is meant to be shared by two or three people, but I was happy I didn’t have to. 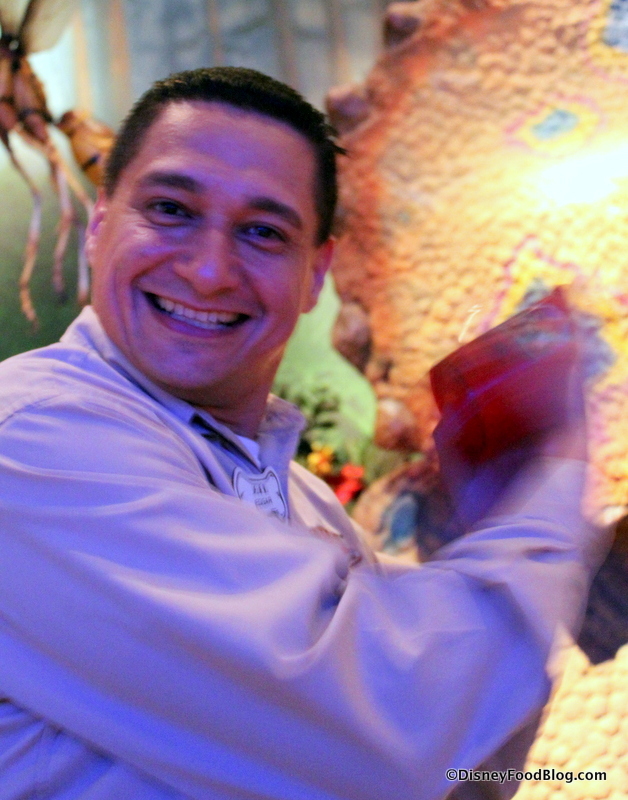 I liked the meal experience with our friends, and the kids had fun, but it’s probably not something I’d do again in the near future, unless it was just to grab the Chocolate Extinction as a quick snack. It’s kind of a “go once” type experience, just to say you’ve been there. Thank you AJ – will not be going here…all you had to say was owned by Landry’s which used to be nice but in the last 10 years has taken a downhill turn. It is a fun restaurant and the food is pretty decent. I save money by ordering an appetizer as my main meal, the portions are so big that I’m stuffed on one app anyway. My fiance loves T-Rex because he loves dinosaurs and he gets a kick out of the atmosphere. I like it okay, not as much as him though. 🙂 Since it’s pretty pricey, we tend to just go on his birthday. Our family went there right after it opened. We were all excited to go for the experience. Knowing ALL the atmosphere was with the theme,we were willing to accept the so-so food.There were 4 of us.Only my son enjoyed his meal. It’s a shame that they go all out with theme design and put nothing into food quality. My kids enjoyed looking around all the rooms and many cute things in the store so the night wasn’t all bad. They just asked me not to book it again. Once and we were done. If you have kids,they’ll love the atmosphere but don’t go in starving,service was slower than acceptable. And yes,the food was pricey for what you get. I don’t mind paying for good food,but we would have been better to go to The Earl of Sandwich(which has awesome tasting food & cheaper) but I guess you pay for all that atmosphere. It was really cute. I tell people about both issues so they can make their own decision. Hey,this isn’t the only once & done for us. We’ll keep trying new places and returning to our favorites too. We love T-Rex! It’s become our “first night in Disney tradition.” My hubbie and I order the nachos to split and we also split our main course. It’s nice on the wallet that way. I adore the atmosphere and for us there’s just something about it and we can’t get enough. Sadly our review ranks much lower than most I have read. While the comments regarding the slow service, just barley average food and very noisy environment are exactly on cue, our experience also suffered some other problems. First after being seated and waiting about 20 minutes for our drinks, I began to guzzle my iced tea (curiously with very little ice), after a long day in the parks. Half way through the iced tea, my kids noticed a disposable cup lid was crushed into the bottom of my glass. Hmm…no ice, garbage in the bottom of the glass, I don’t think I want to put any more thought into it, because I don’t want to know. The waiter was however kind enough to bring me a fresh glass of iced tea with an apology within about 10 minutes. Food service was also slow and accordingly just warm when it arrived. 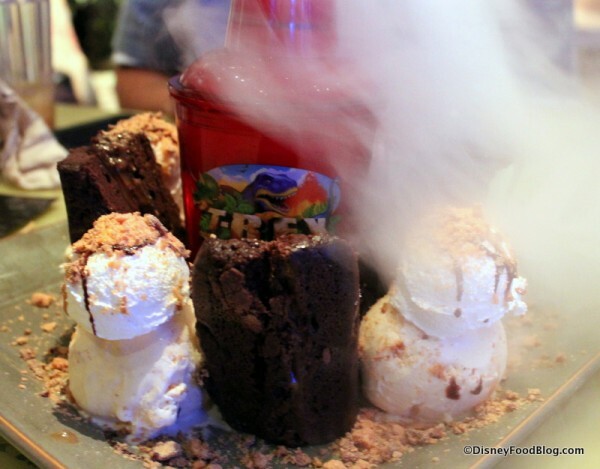 Finally we ordered the extinction desert, which is served with a dry ice “volcano” in the middle of the plate. In the midst of serving cake and ice cream to my kids I noticed three pieces of dry ice about 1/2 inch round and 1 inch long, lying on the plate with the ice cream. Dry ice is nothing but frozen carbon dioxide and pretty much harmless, unless you have prolonged skin contact with it, which causes a burn like injury due to the extreme cold temperature (around -100 F), or very serious injury if ingested. Yeah, and it was on the plate mixed with the desert. I pointed this out to the server and he stated he would tell the kitchen staff, but did not seem alarmed. After speaking with the shift manage, I was promised he would speak with our server, as he is responsible for the drinks and preparing the dry ice centerpiece, which was to have been prepared off to the side of the plate, then the assembled volcano set on the plate, trouble was he did not bother to ask who our server was. Some problems were directly attributable to our server and it is not fair to judge the entire restaurant by one individual, however, the problems seem to be symptomatic of a larger problem. Therefore my opinion of T Rex…Not again if you paid me. We LOVE T-Rex! There were 8 of us on the Deluxe Dining Plan. 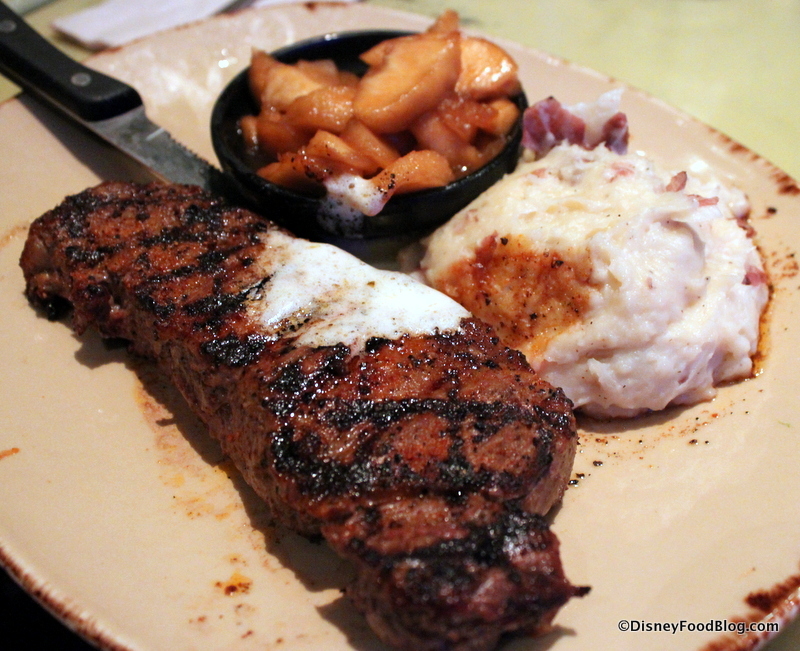 We also had a free dining promo so we only paid about $40 per adult per day for it- WORTH EVERY PENNY. From the stack of onion rings, then the T-Bone and then the deep fried dough for dessert, we more than got our money’s worth. Again, with the dining plan everyone opted for a different app and different entree so that we could all try different items. We had MORE than enough food and by eating lunch there, we had PLENTY to take home for leftovers. It was our last day and we had some extra kid meals on our account. The server was really sweet and let our 3 year old (not on a plan, too young) to order something and use a credit. They aren’t supposed to do that but with less than 24 hours left he was really great about using it. We had dinner there last night, considering the holiday crowd, the service was excellent. Our server Stacey was the best. She was very helpful with our Dining Plan & handled all 8 of us very well. The food was delicious as well. We are sorta locals to Disney Springs area. When i take my 2 kids. We only go for dessert. I buy the chocolate extinction, and we split it among 4 people. This way my children get the experience without us going broke!